Lowdown: The relationship between a zombie and the girl he saved. As hard as it may be, it is important to try and see things from the other side’s point of view before condemning them. That is one of the lessons one can learn from Warm Bodies, an unusual zombie movie about an unusual zombie. Yes, that cataclysmic event has happened and now most of the human population turned into mindless zombies. Yes, the remaining humans have to fend for themselves in horrible conditions: they live in a walled society and have to send scouts to scavenge the hostile outside world. But it’s not that great on the other side: our zombie for the duration of Warm Bodies (Nicholas Hoult, the kid from About a Boy and later Skins) isn’t exactly happy either. He can’t remember much of his past, only seeming to recall his name starts with R. He’s annoyed at being slow moving and slow thinking, too. He envies the living. A zombie got to do what a zombie got to do, and in one of their feeding expeditions R’s group encounter a group of young scouts. R eats the brains of one of the guys, thereby inheriting his memories. These include memories of love for Julie (Aussie Teresa Palmer), also amongst that scout group being eaten. R won’t let the same fate happen to his now loved one; by helping Julie pretend to be a zombie and teaching her the zombie shuffle, he manages to sneak her back home with him. Alive. Home, in this particular case, is a now abandoned airliner at a zombie infested airport. The begging question is, of course, “and now what?”. 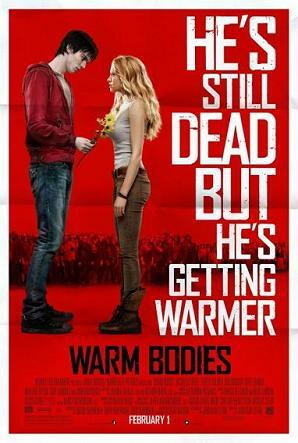 Which is exactly what Warm Bodies explores in a very entertaining, witty, manner. I don’t want to ruin it, but I will say that any suspicions you might have by now as to Warm Bodies’ originality would turn out to be true. Yes, it digs into its genre’s archives, but not half as much as classic horror movies do; this one is more of a romantic comedy that just happens to be set in a Romeo and Juliet type scenario that happens to be set in a zombie post apocalypse. Note the Romeo and Juliet analogy is not out of place, as a lot of the tension comes from the zombie community’s difficulty of accepting a living person into their ranks on one side, and the living’s total rejection of anything zombie on the other (as embodied by the character of the human leader, portrayed by John Malkovich). The result is a movie that achieves two things. First, and as mentioned, it demonstrates the need to see things from the other’s side. And second, it demonstrates the glories of the living and the synergy that happens when the living interact with the living. For if common ground can be found between zombie and human, then surely common ground can be found between human and human. Between warm bodies. Best scene: A rather depressed R informs us of the dull nature of zombies and his yearnings to be more like the living, able to interact with one another and explore the world. Cut into a pre apocalypse scene where we see a group of humans roaming about a shopping mall, each focused on their individual smartphone screen. Overall: I thoroughly enjoyed Warm Bodies, both as sheer entertainment and as a fine example for how simple cinema can effectively deliver worthy messages. 4.5 out of 5 stars.